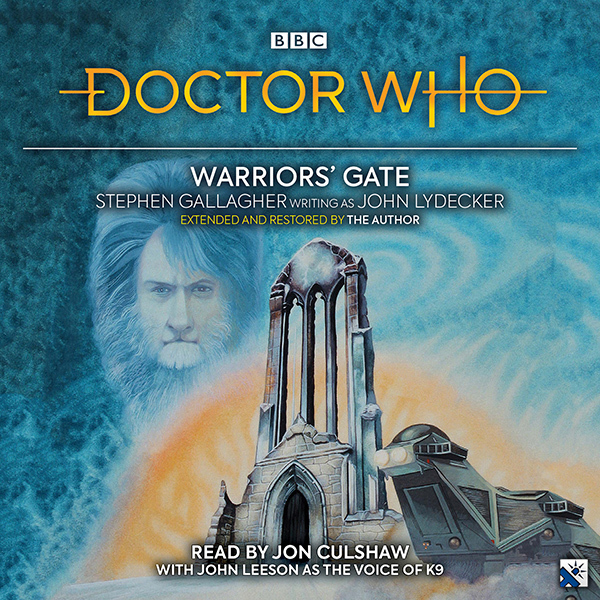 BBC Audio have sent DWO the cover and details for an exclusive audiobook edition of Doctor Who: Warriors’ Gate by Stephen Gallagher, based on the author’s original, never-before-seen version. Warriors' Gate, first broadcast on BBC1 in 1981, was a four-part TV serial in Tom Baker’s final season as the Fourth Doctor. Notable at the time for its high-concept story and its cinematic visual style, it has subsequently become highly regarded as a unique slice of Doctor Who. Writer Stephen Gallagher novelised his scripts for the Target Books range, under the pen name John Lydecker. Before publication, however, the book was substantially reworked and reduced in length. Ever since, Doctor Who fans have speculated about what the original manuscript might have contained. Now, for the first time, Stephen Gallagher has reassembled that original manuscript from his original paperwork, enabling listeners to experience the novelisation as he originally intended it, substantially longer and with significant structural changes. This version also now better reflects the author’s original vision for the TV episodes. + Warriors' Gate is released on 4th April 2019, priced £20.00 (CD) / £7.00 (Download).